JoinusfortheWeSpeakMusicPerformanceSeriesattheairport. TherewillbeliveentertainmentwelcomingJUNOAwardattendees. 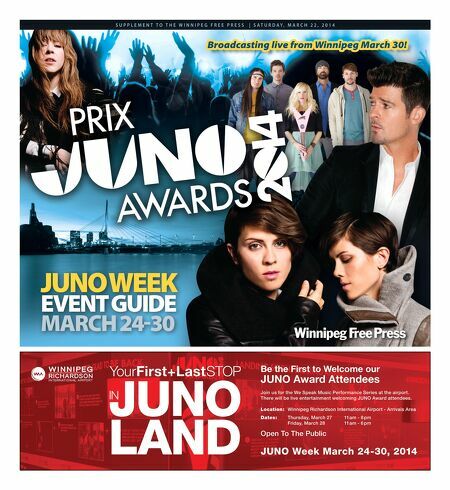 Location: WinnipegRichardsonInternationalAirport-ArrivalsArea Dates: Thursday,March27 11am-8pm Friday,March28 11am-6pm OpenToThePublic JUNO Week March 24-30, 2014 YourFirst+LastSTOP JUNO LAND IN BetheFirsttoWelcomeour JUNOAwardAttendees S U P P L E M E N T T O T H E W I N N I P E G F R E E P R E S S | S A T U R D A Y , M A R c H 2 2 , 2 0 1 4 Juno Week event Guide March 24-30 Broadcasting live from Winnipeg March 30!